A long time ago, there was a community known as New Llano Cooperative Colony. Originally founded in 1914 by Job Harriman, a prominent attorney and Socialist, New Llano was first named Llano del Rio and was located in the Antelope Valley near Los Angeles, California. The New Llano Cooperative Colony name change took place when the community upped stakes in 1917 and loaded everything on a train, moving all the way across the United States to a former lumber mill town originally called Stables. It underwent a name change when the Colony landed. What does this have to do with me, you ask? Ah, there’s a connection, truly. My great-grandparents were Albert Edward Whyland Jaques and his wife, Rachel Mary Greta Jaques. 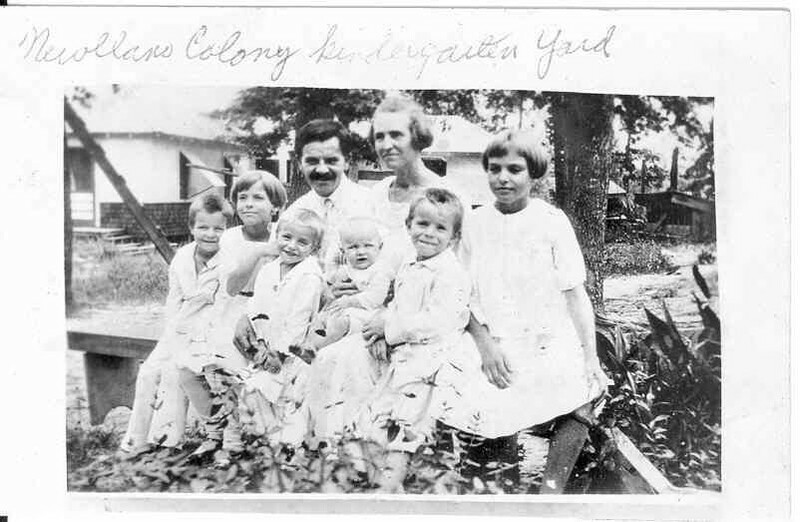 They, along with their six children, joined the Colony sometime before 1925. 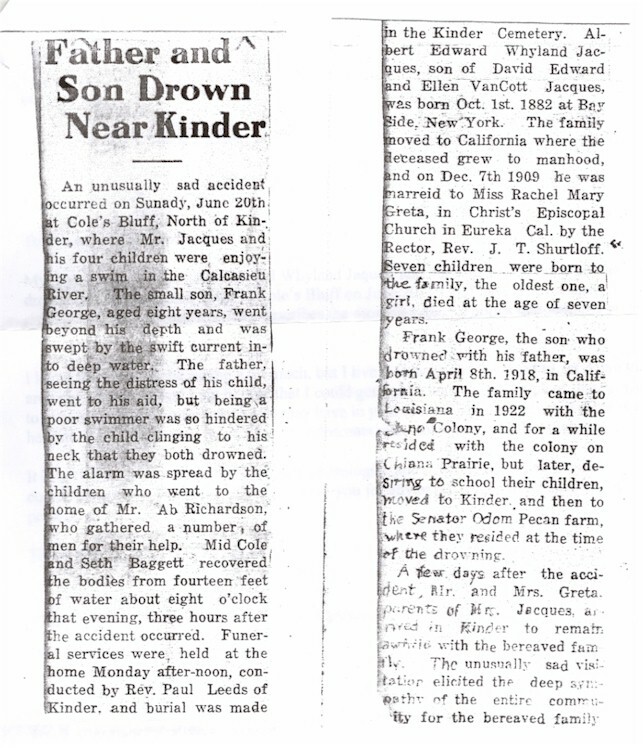 This part of my family history is a tad fuzzy, as my great-grandmother’s papers were originally in the possession of their youngest daughter, Ida, and her relationship with my grandmother Rachel (second eldest Jaques child) was estranged even until Ida’s death. The papers left to Ida by my great-grandmother passed then to one of my second or third cousins and I was most fortunate to get many of them following my grandmother’s death in 1997. Among the papers was quite a collection of information about New Llano Cooperative Colony, including photographs of the move from California to Louisiana. I never did discover just why Albert and Rachel Jaques made the decision to join what was in essence a Socialist commune, but stories my grandmother told me have always left me wanting to know more…she would tell me about how the children were all expected to contribute to the Colony. At the time they moved to Louisiana, the Colony owned a number of enterprises, and among these were a rice plantation and a pecan farm known as the Senator Odom Pecan Farm. Grandma told me that she and the other children would wade into the rice paddies and pick up snakes in the water. 1925 – Albert Edward Whyland Jaques and Rachel Mary Greta Jaques with children: L-R – Albert, Alice, Frankie (the one who drowned) is that adorable smiling blond boy in front of my great-grandfather), Ida (the baby) Chester, and my grandmother, Rachel Mary Jaques. This has been a Finish the Sentence Friday post, hosted by Kristi Rieger Campbell of Finding Ninee. I love that you know so much about your history and yet still want to know more. You make me want to know more about socialist communes and also I'm in awe of the old photos, which makes me know I need to organize my 30,000 “in the cloud” because how will my great grandchildren ever know??? Family history is so important. Sounds like quite the journey. I am glad you know as much as you do. I try to piece things together. This makes for an interesting answer to a prompt. We should never forget where we came from. Kerry, I agree. It wasn't always that way for me, though…I remember we were visiting my paternal grandmother in Missouri when I was like 17ish. She kept inviting relatives over and my sister and I booked out of there and went to my cousin's friend's house and hid out…looking back now, some 40+ years later, I could drop-kick the me I was then. That's why I loved this prompt. So much to discover. I don't know a whole lot about my roots, but I want to. My husband took me to Salt Lake City once, to discover his ancestry and it was highly meaningful.